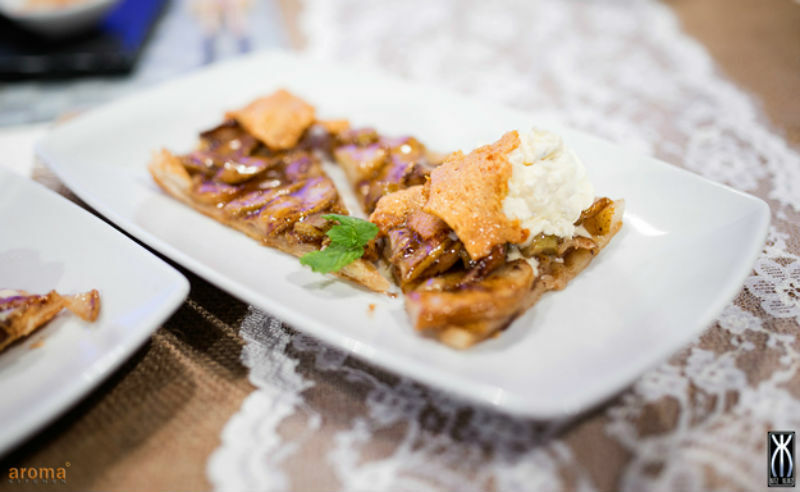 Try out this delicious spiced pear galette with clotted cream, hazelnuts and crushed honey comb. Line a baking tray with baking parchment. Roll the dough 4 mm thick and place on baking paper and prick with a fork. Wash, core and slice the pears thinly and marinade with the lemon juice and zest, the spices and sugar. Bake in a moderate oven temperature 170°c until pastry is cooked and golden. Brush the pears with apricot jam and sliced to desired slices. To make the honey comb; melt the caster sugar and syrup gently on low fire. Cook into a light golden caramel. Remove from heat immediately and stir in the bicarbonate of soda. Pour immediately over a buttered surface, cool completely. Mix the hazelnuts into the clotted cream, serve on the side with the pear galette and sprinkle with crumbled honey comb.